This name occurs only thrice in the Bible, in Isa. vii. 14 and viii. 8, 10 (in the last-cited verse the rendering "God is with us" is given in the English versions). 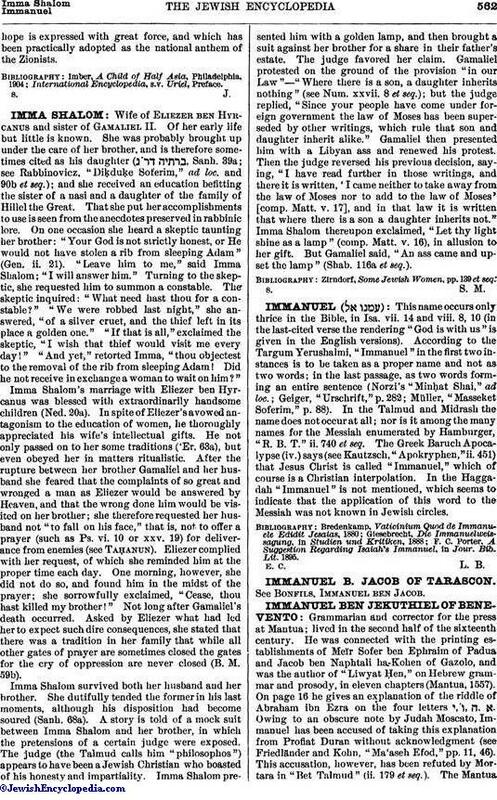 According to the Targum Yerushalmi, "Immanuel" in the first two instances is to be taken as a proper name and not as two words; in the last passage as two words forming an entire sentence (Norzi's "Minḥat Shai," ad loc. ; Geiger, "Urschrift," p. 282; Müller, "Masseket Soferim," p. 88). In the Talmud and Midrash the name does not occur at all; nor is it among the many names for the Messiah enumerated by Hamburger, "R. B. T." ii. 740 et seq. The Greek Baruch Apocalypse (iv.) says (see Kautzsch, "Apokryphen," ii. 451) that Jesus Christ is called "Immanuel," which of course is a Christian interpolation. In the Haggadah "Immanuel" is not mentioned, which seems to indicate that the application of this word to the Messiah was not known in Jewish circles. F. C. Porter. A Suggestion Regarding Isaiah's Immanuel, in Jour. Bib. Lit. 1895.